The theater as we know it was built in 1913, but the second floor dates to 1874. Some old buildings are chock-full of stories. The Village Theatre on Front Street has to be one of the most storied buildings in Danville. The theater as we know it was built in 1913, but the second floor dates to 1874. The second floor was the original Danville Grange Hall, a one-story building which was constructed by Nathaniel Howard shortly after Danville Grange No. 85 was organized in 1873. For decades this hall was the social center for the entire San Ramon Valley. Grange harvest feasts took place in “Grange Park” near the hall and the grammar school on Front Street. Such a feast in 1887 was fully reported in the Pacific Rural Press and brought nearly 1500 people to Danville. By 1912 there were several fraternal orders in town and the need for a larger hall was discussed. Three of the groups, the Grange, the International Order of Odd Fellows No. 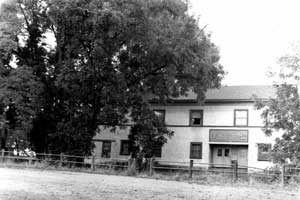 378 and the Rebekahs decided to construct a large building with the old Grange Hall as the second floor. This new Social and Fraternal Hall at 233 Front Street was completed in 1913. The following spring it hosted graduation ceremonies for the first graduates who had attended the new San Ramon Union High School for four full years. After some renovations, in August of 1914, high school classes (which had been meeting in a house) moved to the vacant Odd Fellows rooms upstairs on Front Street. Parties, meetings, plays and musicals took place in the new hall. After the new high school building was constructed in 1917, the hall provided space for graduations and high school basketball games. There were regular dances one Saturday night a month. George Wood recalled that the kitchen was downstairs and the IOOF met upstairs. He also said that the young men who came to the dances would drop beer bottles around, next to the Presbyterian Church which was located next door. Wood remembered the minister patrolling the grounds to pick up empty bottles before church services. Duane Elliott recalled going to the hall with others and listening on the radio to championship boxing matches. Perhaps one was a Max Baer match, since Baer had lived in Livermore and used to come to the Saturday dances. Baer’s nickname was the Livermore Larupper. He was the World Heavyweight Champion in 1934. In 1925 the new Veterans’ Memorial Hall was built to honor war veterans. The Contra Costa Courier on Jan. 23, 1925 stated “It is the purpose of the post not to have the memorial hall compete in any manner with Danville community hall.” With the construction of this hall, the valley had three venues for events: the San Ramon Hall (1911), the Social and Fraternal Hall (1913) and the Veterans’ Memorial Hall (1925). Millie Freitas said that Christmas celebrations during the thirties were held around a large tree in the hall. The kids would go up on the stage one at a time “and Santa would give us an orange and an apple and a bag of candy. We were poor then and it was the only apples and oranges I ever had.” She recalls a raised platform 4-5 feet wide lined with chairs where people would sit waiting to dance. Dr. Wilson Close, who grew up down town, remembered performing in a school play in the hall and having lots of good times there. “People would rent the hall and show movies, hold dances and even have roller skating parties.” Today old timers still have fond memories of the hall before World War II.